This new effort by Tom DeLonge and a high profile team of scientists, intelligence agents and aerospace engineers to disclose the truth about UFOs and ETs focuses on the technology. This is a predicable effort which is better late than never. 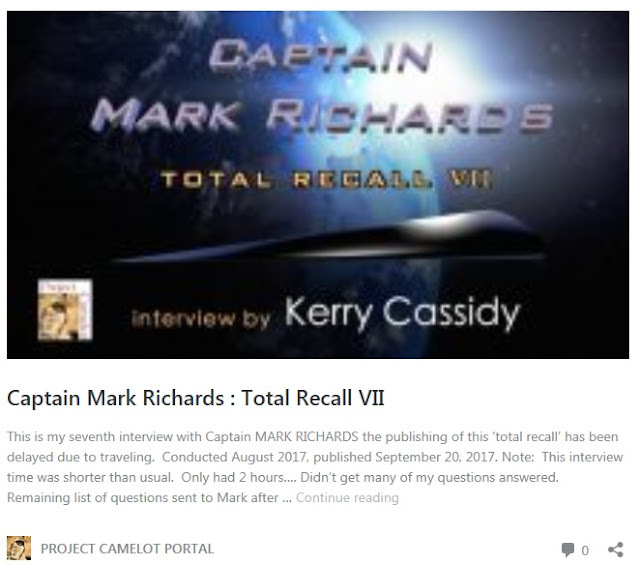 And if it wasn't for the disclosures of Captain Mark Richards revealing that Reptilians are forcing disclosure you probably would think this was coming out of the well intentioned hearts of the team on stage in this video. See below for actual quoted text**. But the truth, as usual, is more complex. Be aware that when certain ET / extra dimensional entities are pushing disclosure because they believe it will create chaos, the humans have no choice but to try to get people up to speed with the truth before that happens. This is the effort you are witnessing. 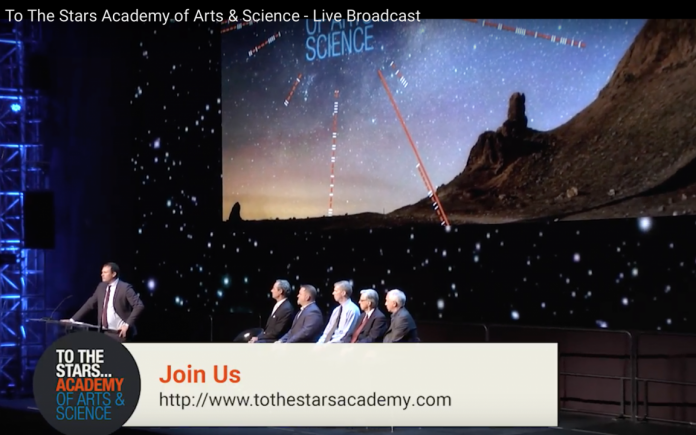 To the Stars Academy is for beginners, newbies and those in denial about whether we are "alone". While for young people with good intuition and awareness this effort is rudimentary. For those in denial and those who are completely lodged in the 3D reality.. where seeing is believing, this will be a beginning. My advice guys, not that you asked, is to reformulate your message to be more clear about who you really are and what you want. Fishing for more ufo reports from the masses is not gonna get it done by the way... In case you haven't noticed UFOs and Abductions have been and are being reported daily on Youtube. Don't act like this is the 1960s... come on everyone knows we are not alone. It's the secrecy you are trying to break through and pretend it's all gonna be different. You are a good potential team but you need to lead with more than some half-assed ufo encounter. Did I hear one of you say "Maybe were not alone"? Really? You are going to have to do better than that or you will all disappear into the dust of history in the making. DISCLOSURE / ALEPPO / REPTOIDS PUSHING DISCLOSURE? I asked him more about status on the Reptoids pushing disclosure, which he had mentioned in my prior interview? The progress — what are they building near Aleppo? A stargate. To bring troops and craft into this dimension. He says they have aircraft carrier sized craft and can bring 5,000 troops in at a time. But he also said they can take back 30,000 to 40,000 human prey, dead or alive... He said they trade human slaves to other races -- it's one of their "businesses". 6 days ago - And three, there are things that are so unimaginable that certain .... you can find on the web by searching on Nimitz UFOs 2004 there I was. 14 Mar 2015 - I had never given aliens or UFOs much thought. ... On the morning of 14 November 2004, Dave and his WSO launched into the clear blue ... before setting off to their assigned work area in the open ocean south of USS Nimitz. 3 days ago - SIGHTING: A UFO that encountered the USS Nimitz ... The truth is out there, these rare photographs of UFO sightings date back as far as 1870. And there were also many other UFO sightings in Western Europe on that same day during the NATO exercise. .... The sensational shots of a silver space-ship on the USS Nimitz were taken in 1989, but hushed up by the Bush ... FSR 2004. USS Nimitz (CVN-68) is a supercarrier of the United States Navy, and the lead ship of her class. ... February 2004 to August 2004 – Planned Incremental Availability – catwalk grating was replaced and flight deck resurfaced. .... new home port of NAS North Island in San Diego, California, arriving there on 13 November 2001. This article or section needs to be revised. See the discussion page for more information . Help improve it , and then remove this marker. This list of UFO sightings and UFO incidents summarize a selection of cases that are considered to be of particular importance to UFO -themics and are often found in the literature on the subject. The entries are classified according to J. Allen Hynek's classification system for UFO encounters . A brief description of cases that do not have their own lemma in Wikipedia. On the night of September 18, 1976, several calls are made to the Tower of Mehrabad Airport in Tehran. Residents of Tehran report an unusual light over the city. Hossein Pirouzi, the flight attendant, can identify the object through binoculars. In his description, a bright, white light with a red light in the middle. After passing on the information to the responsible Luftwaffegeneral general, a Phantom F-4 interceptor for reconnaissance will be launched around 00:30 hours . Both the pilot and the navigator of this jet can see the object. When the interceptor has approached the object, the electronics and communications of the jet fail. The pilot decides to reverse. On the way back, the systems worked again. The jet is landed and a second Phantom F-4 hunter is launched. The pilot of this machine is Major Parwis Jaafari. He and his navigator can also visually confirm the object. Jafari describes the object later as brightly lit and intensely flashing in different colors. On the way to the object, this would have jumped several times over a long distance. The Bordradar could capture the object, according to the pilot and navigator. As the F-4 approaches the object, the electronic electronics are also off. According to Jafari, a small light ball breaks out of the large object and flies towards the jet. Dschafari considers it a rocket and tries to shoot it with a heat-seeking missile . This attempt failed due to the failure of the weapon systems. Jafari also decides to return. The small object pursues and orbits the jet for several minutes, while the jet continues its return flight to the airport. Only after the small object is turned off does the electronic electronics work again. Shortly thereafter, a smaller brightly lit object is observed as it goes to the ground outside Tehran. According to Jaafari, all the objects were abruptly disappeared a short time after their landing. A later investigation of the presumed regional site yielded no results. At around 21:20 UTC-3 (local time), the Brazilian Air Force reported the unidentified flight movements near the city of São José dos Campos . The message comes from the control tower of the airport of the city. Several lights are described which change their color between red, yellow, green and orange and can be detected by radar. The occupation of a civilian machine can confirm the sighting and describes a red star that moves from east to west. At around 22:20 the first fighter jet is launched. A total of five jets, two from the Santa Cruz Air Base and three from Anápolis Air Base, will start in the next two hours. Three of the pilots manage to make contact with the objects. Several radar stations on the ground register the objects during operation. Japan Airlines Flight 1628 is a cargo flight from Paris via Reykjavík , Anchorage to Tokyo . The crew consists of Kenuk Terauchi, copilot Takanori Tamefuji and flight engineer Yoshio Tsukuba. On the way from Reykjavík to Anchorage on 17 November 1986 against 17:10 UTC-9 at an airport of about 10.5 km, Captain Terauchi looks under the Boeing 747 strange lights. Terauchi considers them to be military machines and does not give them any special attention. A few minutes, the lights seem to fly parallel to flight 1628 and follow the engine. At 17:20, these lights disappear and suddenly two larger objects appear before the Boeing 747 . The aircraft crew described the objects later as rectangles on whose long sides several rows of round, bright, yellow lights are. The lights would have illuminated the interior of the cockpit and would have been as intense as plane lights. The light was warm on the skin. The ground radar of the Air Route Traffic Control Center could not capture the objects. Approximately For 10 minutes the objects accompanied the Boeing and flew in formation slight curves. About 17:30 they disappear abruptly. Seconds later, Terauchi removes a larger glowing object in the direction of flight. Terauchi switches on the weather radar of the aircraft and receives the contact of a non-solid object, such as a cloud bank, about 14 km away. Both the civilian ground radar and the military radar of the Elmendorf Air Force Base can also confirm a radar contact. A few minutes later Flight 1628 approaches the town of Fairbanks . In the sky, illuminated by the lights of the city, the occupant defines the silhouette of a large, dark, spherical object, the luminous object being a light of the large spherical object. Terauchi describes the size later as "similar to a plane carrier". Flight 1628 tries to avoid the object in a large curve and leave behind. The object appears to follow the Boeing and is still visible from the side window of the cockpit. In doing so, the object changes its position more than once over long distances. Around 17:40, ground control asks the pilots of a United Airlines passenger aircraft to change their course to confirm the sighting. Against 17:50, before United Airlines comes into sight, the spherical object falls back and disappears from the view of Flight 1628 and the radar. United Airlines can not do anything unusual. Flight 1628 lands at 18:20 at the airport Anchorage. On the evening of August 24, 1990, more than a hundred persons will see bright light globes over the Greifswalder Bodden . The first sightings were made around 20:15 and lasted until 21:00. The spheres were described as "glaringly bright" with reddish-white light and could be seen from Usedom, Rügen and places between Rostock and Neubrandenburg. The objects were divided into two groups of 6-7 lights each. Four videofilms and various photographs were made. None of the videofilms shows the incident in full length, but only a few minutes. Also, most witnesses have observed only part of the time the phenomenon. The objects swayed slightly, but remained motionless. On the films, small light flashes can be seen from time to time. At least once one of the groups was extinguished and then dived again about a minute later elsewhere. Whether this happened several times is controversial. Even if there have been isolated flight movements of the light balls is controversial. Thus a witness reported, "smaller objects flew away from the formations, stopped for a short time and flew back into them". Consensus is that the last items went out around 9:00 pm. On the morning of September 16, 1994, around 10:15, 62 pupils aged 8 to 12 years of the private Ariel Primary School (primary school) observed three unusual objects in the sky. According to the reports, these were round, metallic, and had red flashing lights. They disappeared several times to reappear in another part of the sky. One of the objects would have slowly sunk downwards after a few minutes and had fallen to the ground behind a tree group at a distance of about 100 meters from the school building. At this time, the teachers of the school were at a meeting in the building and dismissed the calls of the children as a game. The Luke Air Force Base has announced that at 10:00 pm so-called flares of military aircraft have been dropped for exercise purposes. Most investigators agree that the second sight wave is due to these flares from around 22:00, so all published photos and videos show these flares. The further investigations refer therefore only to the first sighting wave from 20:15 to 21:00 clock. ↑ Jump to: a B Denis Letty, Jean-Jacques Vélasco, Bernard Norlain, among others: UFOs and Defense: What Should We Prepare For? In: COMETA (eds. ): VSD (magazine) . PrismaMEDIA, July 16, 1999 ISSN 1278-916X , pp 15-16 ( Part 1 [PDF; 773 kB; accessed on 25 April 2012] French: Les OVNI et la Défense: À quoi devons-nous nous préparer? Main source for the case description). , ( Part 2 [PDF, 1.2 MB]). High Jump ↑ Philip J. Class: UFOs: The Public Deceived . Prometheus Books, 1986, ISBN 0-87975-322-6 (English). High Jumping ↑ Werner Walter: Old Story: UFO-Luftkampf im Reich des Schahs? In: Centrales' research network of exceptional heavenly phenomena. 7 May 2007 , retrieved on April 26, 2012 . High Jump ↑ Don Berliner: UFO Briefing Document . Random House Publishing Group, 2000, ISBN 0-440-23638-X ( ufoevidence.org [accessed on October 31, 2012] Main source for expiration description). ↑ Jump to: a b Jose Pessoa Cavalcanti de Albuquerque: Occurrence Report . Ministry of Aeronautics / Air Command of Air Defense. 2 June 1986 ( ufoinfo.com [PDF; 67 kB; obtained on 31 October 2012] Portuguese: Relatório de Ocorrências Document No 008 / CMDO / C-138). High Jumping ↑ Octavio Moreira Lima: The Official UFO night in Brazil - 1986 (ENG subs). Brazilian TV report on the press conference of 23 May 1986. In: youtube.com. CBPU - Centro brasileiro de pesquisas ufológicas, 23 May 1986 , obtained on 31 October 2012 (Portuguese, from minute 6:20): "For many minutes our crafts were followed by these objects [...] But the answer? We can not give you, since we do not have one. " ↑ High jump to: a b José Carlos Pereira: UFOs in Brazil . In: Leslie Kean (Hrsg. ): UFOs generals, pilots and government representatives break their silence . 1st edition. Kopp Verlag, Rottenburg 2012, ISBN 978-3-86445-025-9 , pp. 211-220 (English: UFOs: Generals, Pilots, and Government Officials . Hochspringen ↑ Werner Walter: Where do the celestial globos of Luminosos remain as a heavenly fire from space? In: CENAP - NEWSTICKER. CENAP, August 12, 2010 , retrieved on October 31, 2012 : "Radar perceptions and visually-visible" UFOs "(with strong similarity to just nothing more than planets and stars under inversion viewing conditions distorted [...]) do not match what is obviously the real reason for the whole mess was tense and thrilled in mutually contagious virulent UFO virus hysteria effect. " High Jump ↑ Sasjkia Otto: UFO Files: top 10 UFO sightings. In: The Telegraph. 17 August 2009 retrieved on October 31, 2012 (English): "Geoffrey Perry, a British space researcher, attributed the incident to debris thatwere ejected by Soviet space station Salyut-7 and re-entered Earth's atmosphere around central-western Brazil . " High Jumping Antonio Huneeus: UFO Alert in Brazil . In: UFO Review . New York 1986 (English): "A metallic box with space debris can be. That was not the case of what was seen in Brazil, where the objects had changed, according to Don Berliner: UFO Briefing Document . Random House Publishing Group, 2000, ISBN 0-440-23638-X ( ufoevidence.org ). ↑ Jump to: a b John Callahan: The FAA investigates a UFO incident that "never took place" . In: Leslie Kean (Hrsg. ): UFOs generals, pilots and government representatives break their silence . 1st edition. Kopp Verlag, Rottenburg 2012, ISBN 978-3-86445-025-9 , pp. 235-242 (English: UFOs: Generals, Pilots, and Government Officials . High Jump ↑ Airline crew lake UFO mother ship . Controller, radar confirm object; smaller ships also followed 747. In: Telegraph Herald . 150th Year, No. 310. Dubuque, Iowa & East Dubuque, Illinois December 31, 1986, p. 1 ( news.google.com [accessed on May 3, 2012]). ↑ High jump to: a b Bruce Maccabee: The Fantastic Flight Of JAL 1628 . In: International UFO Reporter . Volume 12, No. 2 (March / April), 1987 ( ufoevidence.org [retrieved on May 3, 2012]). Hochspringen ↑ Paul Steucke: FAA Releases Documents on Reported UFO Sighting Last November . Edited by: Office of Public Affairs, Alaskan Region, Federal Aviation Administration [FAA], US Department of Transport. Anchorage, March 5, 1987 ( russhaywood.com [PDF; 160 kB; retrieved on May 3, 2012]). High Jumping ↑ Philip J. Class: FAA Data Sheds New Light on JAL Pilot's UFO Report . In: The Skeptical Inquirer . Vol. 12, No. 1. Buffalo, NY 1987. *** "
↑ Jump to: a b Werner Walter: The UFO phenomenon of Greifswald - A German classic . In: Skeptics . No. 4, 1999 ( online ). High Jump ↑ Illobrand von Ludwiger: The state of UFO research . 4th edition. Second Edition, Frankfurt am Main 1994, ISBN 3-86150-057-4 , p. 85 et seq. High Jumping ↑ Dennis Kirstein: The Lights of Greifswald - Ufo-Riddle vs. Ifo solution. December 2, 2012 , accessed December 3, 2012 (PDF, 1.6 MB). High Jump ↑ Illobrand von Ludwiger: The luminous balls at Greifswald. Mutual UFO Network - Central European Society, 2000 , accessed April 23, 2012 . High jumping ↑ Andreas Müller: Controversy: UFO skeptics declare again "Greifswald-UFOs" for solved - UFO researchers contradict. In: gre.wi-current. November 28, 2012 , obtained on December 3, 2012 . ↑ Jump to: a b Cynthia Hind: Ufos Over Africa . 1st edition. Horus House Press, Madison, Wisconsin 1997, ISBN 1-881852-15-6 , pp. 217 ff. (English, main source for the expiry of the case). High Jumping ↑ Stephane Allix: Experiencer . 13ème RUE, NBC-Universal Channel & BONNE PIOCHE, 2004 (english, youtube.com ( Memento from December 6, 2012 in the Internet Archive ) - TV documentation, quoted from minute 24). High Jumping Stephen Coan: The day the aliens landed . In: The Witness . Pietermaritzburg April 16, 2008 (English, johnemackinstitute.org [PDF; available on April 23, 2012]). Jump up ↑ Project page "Encounter in Ruwa: The Ariel School UFO Sighting". John E. Mack Institute, obtained on April 23, 2012 (English, movie is still in production and not yet released). ↑ Jump to: a b Leslie Kean: Governor Fife Symington - Steps to Change . In: UFOs generals, pilots and government representatives break their silence . 1st edition. Kopp Verlag, Rottenburg 2012, ISBN 978-3-86445-025-9 , pages 260-262 (English: UFOs: Generals, Pilots, and Government Officials Go On the Record Translated by Helmut Kunkel.). High Jump ↑ Richard Price: Arizonans say the truth about UFO is out there . In: USA Today . March 18, 1997 ( ufosnw.com [PDF, 1.4 MB, accessed on 3 May 2012] The main source for testimonies). ↑ High jump to: a b c Tony Ortega: The Phoenix Lights Explained (Again). In: eSkeptic. The Skeptics Society, May 21, 2008 , retrieved on May 7, 2012 (English, main source for expiration). High Jumping ↑ Bruce Maccabee: Report On Phoenix Light Arrays. In: Bruce Maccabee Research Website. September 30, 1998 , retrieved on May 7, 2012 (English). High Jumping ↑ Peter B. Davenport: Summary of "Phoenix Lights" Event. In: National UFO Reporting Center. Archived by the original , retrieved on May 7, 2012 (English): "Another interesting aspect of the case is the virtual absence of coverage in the print media, save for a handful of articles in local newspapers. [...] It was not until mid-June, almost ten weeks later, that the national press took any interest in the incident with the appearance of a front-page article in USA Today on June 18, 1997. " ↑ Jump to: a b Fife Symington III: A correct position . In: Leslie Kean (Hrsg. ): UFOs generals, pilots and government representatives break their silence . 1st edition. Kopp Verlag, Rottenburg 2012, ISBN 978-3-86445-025-9 , pp. 275-276 (in German: UFOs: Generals, Pilots, and Government Officials Go On the Record, Translated by Helmut Kunkel). High Jump ↑ Werner Walter: CENAP Report. No. 287, December 2003. In: CENAP Report. December 2003 , p.44 retrieved on May 8, 2012 (PDF, 1.5 MB): "[...] roughly V-shaped suspension of flares hanging static over a military training area. [...] In the aftermath, a few people would have seen a huge, V-shaped object with a gray-metallic wall, and with which the recorded lights were located. [...] Obviously, there is once again a psychologically-conditioned "alienation potential", which in this case also intersected with some UFO idealists. " High Jumping ↑ Brian Dunning: The Alien Invasion of Phoenix, Arizona. In: Skeptoid # 41. April 26, 2007 , retrieved on May 8, 2012 (English, Podcast transcript): "The only other dissenting evidence is the mass of eyewitness accounts. Unfortunately all such stories are in direct contradiction with all the photographic evidence. [...] The Phoenix Lights were flares. Deal with it. " High Jumping ↑ Tony Ortega: The Great UFO Cover-up. In: Phoenix NewTimes. 26 June 1997 , retrieved on 7 May 2012 (English). UFO Evidence - A site with different UFO incidents, photos and articles on the subject. The Committee for Skeptical Inquiry - Discusses the UFO phenomenon critically and has published statements on many UFO sightings. Retrieved from " https://de.wikipedia.org/w/index.php?title=List_of_UFO-Sights&oldid=164367874 "
This page was last modified on 8 April 2017, at 19:26.